Research focused on modern Japan, in global and regional perspectives. Located in one of the important economic and political hubs of East Asia, Tokyo. How Can We Explain the Lag of Japan’s Sharing Economy? In recent years, the emergence of “sharing economy” has brought people plenty of conveniences to collaboratively make use of under-utilized inventory through fee-based sharing. The topic of the sharing economy has also caught attention in public and academic debate. According to Yano Institute, the size of the Japanese sharing economy by transaction is 0.64 billion USD in 2017 and is estimated to reach only about 1.24 billion USD by 2022, which is relatively weak compared with other developed countries and even some developing countries. The Japanese Ministry of Internal Affairs and Communications also states that the size of Japan’s sharing economy is relatively small. This research tries to seek answers to the question of why Japan’s sharing economy has evolved relatively slowly. Because there is no existing theory to explain the lag of Japan’s sharing economy, this research regards the sharing economy as a new form of process innovation that creates a new way for people to get access to goods and services. Taking a macro perspective theoretically informed by the National Systems of Innovation (NSI) literature, this research adopts semi-structured interviews to acquire in-depth insights from industry insiders. Contemporary artists are increasingly creating works that lack the presence of the human, as if to imagine a posthuman world, a posthumous world, a world without us. Such posthuman use of androids draws attention to the significance of negotiating different states of perception and transcending established value systems to sustain a viable position in a global world. But the human instinct to create images of ourselves is still strong, as we see not only in the androids used in the robot theatre of Ishiguro Hiroshi and Hirata Oriza, but also in such popular virtual idols as Hatsune Miku. Prof. Mari Boyd will situate the new 21st century development in Japanese robot/android theatre in two contexts: first, the karakuri (trick) automata popular from the 17th century and, second, the present national push in branding Japan as a society 5.0, i.e. a technology-based society emerging through the fourth industrial revolution. Intersections between entertainment industries and artificial intelligence research in Japan have resulted in a growing interest in modeling affect and emotion for use across a variety of media platforms, including wearable devices, virtual reality, and in particular companion robots. Combining advances in computing with market explorations in technologies of care and companionship, the most recent social robots created for popular consumption in Japan augment a sense of presence and intimacy by literally giving these platforms a face. This attention to the design and ascription of agency to media technologies enables a feeling of co-awareness that incorporates non-human entities into the social network of relationships. Moreover, as these robots connect human users while also inviting them to interact directly with robot bodies via tactile features such as furry bodies and wagging tails, with sensors connected to cloud-based artificial intelligence, they not only facilitate affective interactions but also enable the collection of new kinds of emotional data. Das DIJ sucht eine/n wissenschaftliche/n Mitarbeiter/in mit Forschungsschwerpunkt in den Geistes-, Sozial- oder Wirtschaftswissenschaften des modernen Japan, auch im globalen Kontext. Erwartet wird selbständige wissenschaftliche Arbeit an einem Forschungsprojekt, das sich aus sozial- oder geisteswissenschaftlicher Sicht mit Fragen der digitalen Transformation befasst. Durch Studium nachgewiesene Kenntnisse auf dem Gebiet der Mathematik und/oder Informatik sind wünschenswert. Bewerber/innen sollen ein Konzept zu Ihrem Forschungsvorhaben vorlegen, das Fragestellung(en) und Methode(n) erläutert und darüber hinaus auch Anknüpfungspunkte an aktuelle internationale Forschung und Möglichkeiten der Kooperation mit Partnern in Japan, Deutschland oder Drittländern aufzeigt. Neben der Forschung wird auch die Mitarbeit an allgemeinen Institutsaufgaben erwartet. Der Arbeitsort ist Tokyo. As Japan has the sole custody system after divorce, there are a number of parental disputes over child custody and visitation or access nowadays. Currently, only 1/3 of children with divorced parents can have access to their non-custodial parent, and only 1/4 of children obtain child support from their non-custodial parent. In contrast, Germany and other Western countries have implemented joint custody after divorce, which requires both parents to consult with each other and take joint decisions in relation to long-term issues concerning their children. The divergent legal settings and societal conditions between Japan and Western countries yield difficult questions in a cross-border family separation. Prof. Nishitani will address the historical, legal and societal background of these differences in family law institutions between Japan and Western countries with a particular focus on Germany. Prof. Odagiri will show what we have learned about the impact of divorce on children from research in psychology and what actions are now being taken. Individualization and mobility increasingly define romantic relationships. ‘Despatialization’ and internationalization of work and education have intensified tensions between occupation and relationships. Therefore, as couples negotiate and coordinate their lives, flexibility and agency become more necessary to sustain relationships. Decisions along the life course demand privileging either individual autonomy or dyadic belonging. As all options likely imply trade-offs, actors will try to balance autonomy and belonging. This is for example the case in long-distance relationships (LDR), which can be seen as ‘solutions’ to systemic challenges, that, however, cause new challenges. Against this background, my talk asks how long-distance couples ‘manage’ distance, belonging and their life courses. The DIJ Tokyo is partner with the multi-disciplinary and transnational EU project “ACCESS – Supporting Digital Literacy and Appropriation of ICT by Older People”, which is coordinated by Professor Claudia Müller of the University of Siegen. Goals are to explore and evaluate ways for elderly people to learn the usage of modern ICT solutions that promise a better social participation and an overall improvement of the quality of life. The DIJ is responsible for the project’s Japan-related research. The DIJ and the Institut français de recherche sur le Japon à la Maison franco-japonaise concluded a Memorandum of Understanding in which both institutions agreed upon closer exchanges in the areas of socio-scientific and humanistic Japanese Studies. The Memorandum of Understanding places particular emphasis on developing and expanding the potential of joint research and events. From April 29 to May 5 the DIJ will be closed due to “Golden Week”. On Monday May 6, 2019 we are back to regular hours. In October 2018 we celebrated the DIJ’s foundation 30 years ago — with lots of inspiring speeches and fruitful conversations. 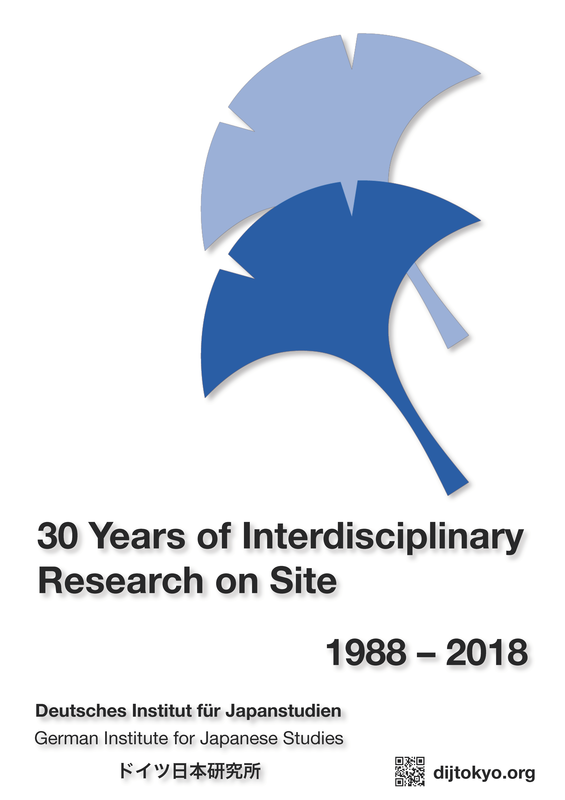 Our anniversary booklet gives an overview of the past 30 years here at the DIJ.